Sydney Band 580 are are a fresh, contemporary and distinctive Sydney based 5-piece event band with a dynamic female vocalist, who deliver an incredible performance every time. The band will create an electrifying atmosphere making any event one to remember. Sydney Band 580 up-to-date repertoire is composed of guaranteed floor fillers ALL played live suitable for audiences young and old! When you book Sydney Band 580 you know you’re getting cutting edge musicians and sounds. The band has worked all over Australia in countless 5 star hotels, wedding venues and pubs and clubs for a dazzling variety of events and companies. they provide nothing less than the highest standards of performance and musicianship. Their energy is explosive all night long. If you’re looking for a 21st century event band to provide high quality, first class musical entertainment, your worries are over! 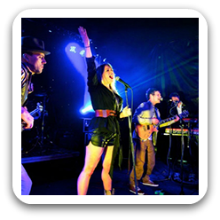 Look no further, the will be Sydney Band 580 in rocking your event!